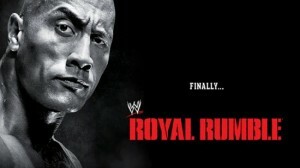 Mike Dishes It Out Cold on the 2013 WWE ‘Royal Rumble’!!! The Rock is the new WWE Champion, and this guy and I are pissed off about it – CLICK HERE TO SEE HOW PISSED OFF WE ARE!! On Sunday morning a friend said that there was no way The Rock would win the title because he wouldn’t want to appear on television every week. For those of us that care about the WWE product, that condescension stings. It implies that the WWE Championship is beneath The Rock; that he can just drop in after 9 months off, win the title, and then show up when he wants because we as wrestling fans should just take what we can get. And does it really build the brand to allow The Rock to steamroll a guy who held the title for 434 days only to leave after Wrestlemania? I don’t think it does. I will therefore pay the WWE $54.95 to watch February’s “Elimination Chamber” pay-per-view under protest. The Royal Rumble had some good times too. Here are my thoughts on the two other marquee matches, the World Heavyweight Championship match and the Royal Rumble itself. Alberto Del Rio used to be one of the most hated villains in WWE – an arrogant Mexican aristocrat with a personal ring announcer who speaks Spanish (boo!) and who strolled into the arena driving a different luxury car each week. Then on Christmas Eve he ran over Santa Claus in one of those luxury cars. This led to a Miracle on 34th Street Fight (obviously) in which Santa interfered, causing Del Rio to lose and completing a Christmas parable I haven’t quite figured out yet. This run-in with Santa caused Alberto to do some serious soul searching. Now he’s a hero — an arrogant Mexican aristocrat with a personal ring announcer who speaks Spanish (yay!) and who apparently doesn’t drive luxury cars anymore. Was this all a roundabout way for WWE to cut the cost of renting a Rolls Royce in every town it visits? Maybe. Alberto’s opponent, the Big Show, would have been the greatest wrestling attraction of all-time had he been born 20 years earlier. If fans only saw the Big Show once a year, it would be a huge deal for the local hero to beat him. Instead, he’s on television every week losing to every hero that WWE tries to create, in increasingly humiliating ways. Last night’s humiliation came when Ricardo Rodriguez (Alberto’s personal ring announcer) used a roll of duct tape to tie Big Show’s feet to the bottom rope, thus incapacitating him for the necessary ten-count and allowing Alberto to retain the championship. Big win for Mexican ingenuity, big loss for overactive thyroids. – The Royal Rumble is billed as a random draw, but the guy who draws number 2 always has some karmic connection to whoever drew number 1. This delights me every year, but a returning Chris Jericho (#2) coming back to confront Dolph Ziggler (#1) after Ziggler ended his career in August was especially rich. – Speaking of Ziggler, congratulations to Alfonso Ribiero for revitalizing his career as Dolph Ziggler’s body guard, Big E. Langston. I just hope the ensuing steroids scandal doesn’t send him back to a dark place. – The most believable brother vs. brother feud in wrestling history finally got going when Cody Rhodes eliminated his brother Goldust. Goldust looks like his dad, Dusty Rhodes (punch that into a Google image search and come back), and rose to wrestling prominence playing a flamboyant gay character in a gold onesie. Cody Rhodes looks like he strolled in straight from the beach volleyball scene in “Top Gun” and his character can best be described as “good looking guy with a mustache.” If I’m Goldust and my brother is Cody Rhodes, I probably want to fight him. And if he eliminates me from the Royal Rumble? Well, the only acceptable place to settle that insult would be Wrestlemania. 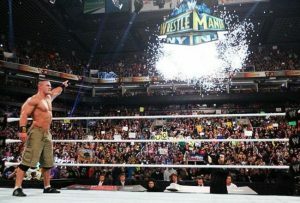 – John Cena eliminated Ryback to win the Royal Rumble. This made me happy because I’m pretty sure the Ryback character is Republican propaganda intended to undermine Michelle Obama’s Let’s Move!” campaign. The guy just repeats “Feed Me More!” and Middle America cheers, totally disregarding the consequences of overeating and unhealthy dietary habits. I’m on Team Michelle. WWE: Raw Review December 15th, 2014!! WWE: What To Expect from ‘TLC 2014’!! WWE: Hell in a Cell 2014 Preview!! This entry was posted on Tuesday, January 29th, 2013 at 5:49 pm	and is filed under Events, Film, News, Television. You can follow any responses to this entry through the RSS 2.0 feed. You can skip to the end and leave a response. Pinging is currently not allowed. « The ‘Powerpuff Girls’ Are Back!! [in the Watergate hotel; on phone with security] Yeah, sir, you might want to send a maintenance man over to that office across the way. The lights are off, and they must be looking for a fuse box, 'cause them flashlights, they keep me awake.